Forty-seven years ago, in September 1968, Congress authorized President Lyndon B. Johnson to proclaim National Hispanic Heritage Week. Twenty years later, Congress and President Ronald Reagan expanded the observance to a monthlong celebration (Sept. 15 through Oct. 15) of the culture and traditions of those who trace their roots to Spanish-speaking nations of Central America, South America and the Caribbean. The answer is always the same: a timeless promise of prosperity and equality that America offers to this very day. Things have changed a lot since my first visit to Nashville in the early '90s. Despite the recurring and irrational xenophobic rhetoric that still sometimes emanates from my fellow Tennesseans, the Volunteer State has become a beloved home for so many Latinos. Perhaps, as Cervantes said in "Don Quixote," all we need is to "trust time, which often brings sweet outcomes to many bitter difficulties." Nationwide, Hispanics are 17 percent of the U.S. population, according to new figures released by the U.S. Census. That’s 55 million of us who have been woven into the U.S.’ bright cultural fabric. Hispanics also are an integral part of our nation’s — and our neighborhood’s — economic picture. Hispanic-owned small businesses are growing at three times the national rate. This is vital to every worker, given that more than 70 percent of new jobs in our country are created by small businesses. Approximately 20 percent of small businesses are immigrant-owned, and they contribute nearly $776 billion to the U.S. economy. In fact, immigrants employ 1 out of 10 American workers. Forty percent of Fortune 500 companies were created by an immigrant or by the children of immigrants. The list reads like a who’s who of our nation’s premier employers: AT&T, Bank of America, eBay, Yahoo, Intel, Kohl's department stores and Google. It can no longer be said that we are here to take your job. Instead, we might be able to give you one. Besides the tremendously positive economic and cultural impact these immigrants are having, there is political power in our numbers. The Hispanic vote could well decide the outcome of the next presidential election. That’s a game changer. Our voice counts. Over 8 percent of votes cast in the last presidential election were Hispanic. Our Hispanic community is often known for being a willful accomplice for those looking for cheap labor, but Hispanics also are known for their willingness to serve to protect our freedoms. Today we have over 200,000 Hispanic Americans serving in the military and 1.2 million Hispanics 18 and older who are veterans of the U.S. armed forces. As I lead our monthlong recognition of the many contributions Hispanic Americans have made to this country, joined by the leadership of our Hispanic chamber, its members and a powerful network of corporate and community partners, I see we are no longer alone in the room. We have all come from somewhere, and we can celebrate our roots, recognizing that what truly unites us as a nation is not that we all were born here, or that we happen to live here, but that despite our different backgrounds we share a common ideal, a sense of belonging and the belief in a promise. Yuri Cunza is president and CEO of the Nashville Area Hispanic Chamber of Commerce. Not exactly being a sports connoisseur, it was kind of surreal to stand before 68,000-plus people and receive the Tennessee Titans’ NFL Hispanic Leadership Award on Sept. 22 at their Hispanic Heritage game. A humbling experience, as this date marked the seventh anniversary of the day I became a U.S. citizen in a ceremony at The Hermitage, home of former President Andrew Jackson. This is just one example of how our country celebrates the contributions of those who trace their roots to Spanish-speaking countries, from Francisco Vasquez de Coronado’s exploration of North America to Ellen Ochoa, the first Hispanic woman astronaut; Cesar Chavez’s impact on workers’ rights to Sonia Sotomayor’s appointment as the first Hispanic woman on the Supreme Court. I wish I could share this great honor with the many Hispanic immigrants in our local community who’ve come to our shores to benefit our great nation. Despite the hard work and dedication of the millions of Hispanic immigrants who have enriched everything from our national pastime to our national history, the critical role they’ve played in advancing a vital aspect of our country’s well-being, our economy, continues to be ignored. Despite the endless anti-immigrant rhetoric and immigration reform broken promises that not even a federal government shutdown seems to stop, away from the spotlight of local, state or national dedication ceremonies, the Hispanic immigrant business community has been quietly but substantially aiding U.S. economic growth and job creation. There are about 3.2 million Hispanic-owned businesses in the U.S., generating more than $468 billion in revenue just in 2013, according to a study by consultancy Geoscape. And we are fortunate to have a piece of that action here in our local market with over 1,800 Hispanic-owned businesses in Davidson County alone. Together, we foster economic development opportunities and sustainable business prosperity to impact our area’s diverse, vibrant and successful communities. Every month immigrants from Mexico, Guatemala and Cuba alone launch more than 63,000 new U.S. businesses. Latina entrepreneurs are leading the charge, opening businesses six times faster than the national average, representing a 44 percent growth of all Hispanic-owned businesses, providing a collective boost of an estimated $465 billion annually to the nation’s economy. These Hispanic entrepreneurs aren’t expecting trophies for their important contributions. Like me, they’re just grateful to be in a place where free enterprise flourishes and people of all backgrounds can work hard to make a better life for themselves and their families. The least we can do to honor their hard work and keep our economy strong is to fix our broken immigration system, which for too long has hindered America’s ability to continue attracting and retaining foreign talent. Today, as we close Hispanic Heritage Month with our ninth annual Business & Community Excellence Awards, we, too, join in celebrating the cultural, economic, professional and civic contributions of the more than 53 million Hispanics living in the U.S. who stand behind the scenes or in the frontline of our economic recovery. Let’s think for a moment: Hispanic entrepreneurial spirit leading the nation in small business startups, presenting a potential source for future innovation, job creation and prosperity for all, seems a great reason to celebrate. Returning to the annual Legislative Summit of the U.S. Hispanic Chamber of Commerce in Washington, it was gratifying to see leaders on both sides of the aisle coming together to fix our nation’s broken immigration system. From the White House to Capitol Hill, there is broad consensus among Democrats and Republicans alike that meaningful reform can no longer wait. A considerable portion of the debate has been focused on border security and a pathway to citizenship for the 11 million-plus undocumented immigrants currently in the U.S. But while fixing the problems of the past are undoubtedly important, we also must look forward by creating an immigration system that can bolster our economy, create American jobs and help us attract and retain the talent we need to stay competitive on the world stage. To start, we should provide green cards to the top foreign-born graduates at U.S. universities who earn advanced degrees in science, technology, engineering, or math (STEM) fields. Across the country and right here in Tennessee, we often train and invest resources in scores of these students at top schools such as Vanderbilt and the University of Tennessee. And while they are here, they are helping drive innovation in our university labs and classrooms. Of the patents generated in 2011 at the country’s top 10 patent-generating universities, 76 percent had a foreign inventor. After these future job creators graduate, we often send them back home to compete against us in the global marketplace, simply because there are no visas for them to stay. It’s an illogical system, especially given that, on average, these STEM graduates create 2.62 jobs. Immigrants have always been a driving force behind the advancement of the American dream. A study by the Partnership for a New American Economy found that more than 40 percent of Fortune 500 companies were started by immigrants or their children. Google, AT&T, eBay, Intel and Kohl’s are among the companies started by immigrants or first-generation Americans. It is no secret that innovation drives the American economy, and without good ideas and skilled workers, our country won’t be able to transform industries or lead the global economy as effectively as it has done for decades. Immigrants bring new ideas, initiative and, above all, a strong work ethic and desire to succeed. Immigration is an integral component of our economic policy, directly impacting the competitiveness of our country’s workforce. Whether it’s a major American corporation or a local neighborhood shop, immigrants are now more than twice as likely to launch a business as native-born citizens. Immigrant-owned businesses generate an estimated $775 billion in annual revenue and employ 1 out of every 10 American workers. Smart and sensible immigration reform can help drive innovation and spur job growth. For too long, our broken system has been depriving our country of the very immigrants who have helped make us great. If we don’t do anything to fix our laws, the result could be a devastating blow to America’s economic well-being. Without needed reforms, we will continue to lose the critical talent and ideas that help our nation flourish. Comprehensive immigration reform is long overdue. It will compromise the prosperity of our nation if not addressed now. It will be good for business, as it will facilitate a pathway for compliance and new opportunities for immigrant workers. If this is not enough, comprehensive immigration reform promises an end to the underground U.S. labor market in undocumented immigrants, allowing U.S. businesses to safely and reliably meet their labor demands. As the immigration debate ensues over the next few months, Washington’s highest priority must be passing legislation that will drive economic growth for the next generation. Join me and the millions of Americans nationwide in calling on our leaders to act in the name of keeping our economy strong. Yuri Cunza is president and CEO of the Nashville Area Hispanic Chamber of Commerce and a member of the Partnership for a New American Economy. As our country celebrates Hispanic Heritage Month, it’s not difficult to find areas where this nation continues to benefit from the significant contributions of the Hispanic immigrants who’ve come to our shores. Just last week, Americans witnessed Venezuelan-born Miguel Cabrera capture baseball’s Triple Crown, becoming only the 15th Major League Baseball player to ever do so. A few days later, President Obama dedicated the Cesar E. Chavez National Memorial, honoring the Mexican-American labor leader and civil rights activist with a monument that joined the likes of the Statue of Liberty and the Grand Canyon. These are just two shining examples that illustrate the extent to which Hispanic immigrants have enriched everything from our national pastime to our national history. But too often we overlook the critical role they’ve played in advancing an area that’s particularly vital to our country’s well-being: our economy. Away from the spotlight of major league sports and presidential dedication ceremonies, the Hispanic immigrant business community has been quietly but substantially aiding U.S. economic growth and job creation. Over the past 15 years, American entrepreneurship has declined by 10 percent, according to a recent study from the Partnership for a New American Economy. But immigrants have become more than 50 percent more likely to start a business over this period, with Hispanic immigrants leading the way. Every month, immigrants from Mexico, Guatemala and Cuba alone launch more than 63,000 new U.S. businesses. Immigrants from Mexico now own more than 500,000 businesses here in America, generating nearly $17 billion in income annually. These Hispanic entrepreneurs aren’t asking for trophies or monuments as thanks for their important contributions to this country. Like me, they’re just grateful to be in a place where free enterprise flourishes and people of all backgrounds can work hard to make a better life for themselves and their families. But the least we can do to honor their hard work and keep our economy strong is to fix our broken immigration system, which for too long has hindered America’s ability to continue attracting and retaining foreign talent. With large shortages in key fields such as science, technology, engineering and math (STEM) and with baby boomers set to retire in droves over the next several years, we’ll need more talented young people to keep the U.S. workforce vibrant and productive. Immigration is a budget-neutral way to meet both these needs. We can enact reforms such as giving green cards to STEM grads so we can meet the projected shortage that we’ll face by 2018 of more than 200,000 advanced degree STEM workers. Congress also can pass the DREAM Act — a bill to offer a pathway to legal status for eligible young immigrants who were brought here as children and who complete high school and some college or military service — which would add $329 billion to the U.S. economy and create 1.4 million new jobs by 2030. As a business leader and a Hispanic immigrant, I know that repairing our immigration policies is not only a moral imperative but also an economic one. This is why today, during our eighth annual Hispanic Heritage Month Business & Community Awards, we are proud to celebrate the cultural, economic, professional and civic contributions of the more than 52 million Hispanics living in the U.S. — including the estimated 10 percent of Nashvillians who stand day by day, behind the scenes, or on the front line of our economic recovery. My hope is that by next year’s Hispanic Heritage Month, we will celebrate a renewed American economy — and the Hispanic immigrants who helped make it happen. As an immigrant CEO of a 12-year-old membership organization dedicated to fostering integration, economic development opportunities and Hispanic business sustainability, I know firsthand the benefit what immigration brings to our local and national economies. I came here to make a better life for myself and my family, and continue working countless hours to achieve that goal. My story is not unique. It is repeated every day all over America. Immigrants to this country have had a powerful impact on our economy. More than 40 percent of America’s Fortune 500 companies were founded by an immigrant or a child of an immigrant, and Hispanics in particular are three times as fast to start a business as the native-born. But this is not the immigration story I read about in the papers or hear about in presidential debates. To follow the media and political narratives about immigration, one would think that all immigrants are low-skilled, are here illegally, and plan to vote for whichever candidate wants to open the border, if they plan to vote at all. These stories are as inaccurate as they are offensive. They are used politically to demagogue and win elections, and they stand in the way of honest attempts to legislatively fix the problems presented by our current immigration laws. It is time to have an open and honest debate about the role that immigrants play in our country. Let’s look at the role immigrants play in founding companies and inventing new products. Let’s look at the role they play in filling jobs at the low- and high-skilled end of the economy that we Americans are unwilling and unable to fill. And let’s look at real ways to fix our broken immigration system. Here’s what we know about immigrants in the economy. 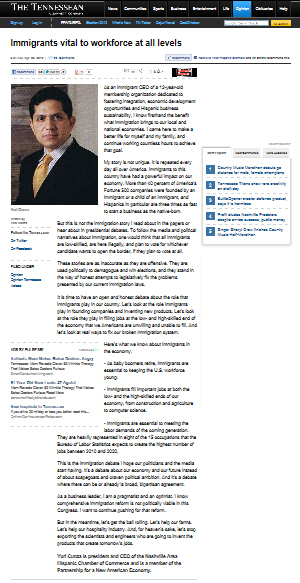 • As baby boomers retire, immigrants are essential to keeping the U.S. workforce young. • Immigrants fill important jobs at both the low- and the high-skilled ends of our economy, from construction and agriculture to computer science. • Immigrants are essential to meeting the labor demands of the coming generation. They are heavily represented in eight of the 15 occupations that the Bureau of Labor Statistics expects to create the highest number of jobs between 2010 and 2020. This is the immigration debate I hope our politicians and the media start having. It’s a debate about our economy and our future instead of about scapegoats and craven political ambition. And it’s a debate where there can be or already is broad, bipartisan agreement. As a business leader, I am a pragmatist and an optimist. I know comprehensive immigration reform is not politically viable in this Congress. I want to continue pushing for that reform. But in the meantime, let’s get the ball rolling. Let’s help our farms. Let’s help our hospitality industry. And, for heaven’s sake, let’s stop exporting the scientists and engineers who are going to invent the products that create tomorrow’s jobs. Yuri Cunza is president and CEO of the Nashville Area Hispanic Chamber of Commerce and is a member of the Partnership for a New American Economy. about making pad Thai and more recent forays into hummus-making. For the Peru native, president of the Nashville Area Hispanic Chamber of Commerce, his Latin roots may hold the strongest, but his kitchen feels like a session at the United Nations. Cunza appreciates that food can help educate about life experiences and culture, no matter the geography of the upbringing. As part of our Nashville Cooks series, Cunza invited us into his home to teach us to make his version of ceviche (fish marinated in lime juice), sangria (a fruity, wine-based cocktail) and chupe, a traditional fish stew that his grandmother prepared in their native Lima. The stew's showpieces include a poached egg and shrimp simmered in spicy stock, along with Peruvian staples such as beans and potatoes. But despite the drama of the dish, chupe is simple, wholesome and down-home. "Its origins are humble, nutritious," Cunza said. "It's the best thing you can do without spending a lot of money." Cunza grew up learning to cook from his grandmother, Teresa Palomino Oré, whose family and friends all called her "Mama Teresita." She never used a recipe, so neither did Cunza as he tossed a large shrimp in oil until it turned pink. "The shell releases some flavor," he said. "It's like browning the skin of a chicken." Though chupe is a special-occasion dish that Cunza remembers from Sunday afternoon dinners with houseguests, its ingredients come from what grows around the home — fava beans, potatoes (Peru has 2,500 varieties of the root vegetable) and spices. And despite the importance of the dish in Peruvian culture, it can be quick to prepare. Cunza whipped up his version in about 30 minutes by adding frozen peas and shrimp as shortcuts. "In Latin cultures, we function on inspiration. Just having the formula isn't enough," he said. "I don't cook with recipes. I know what each one of the elements will do. I know what pepper will do to food, or salt." Along with forgoing formal instructions, Cunza, like Mama Teresita, practices cooking with positive intention, generously giving both time in preparation and ingredients, and thoughts of those who will enjoy the food he prepares. "It takes caring," he said. "You're feeding someone. I think (Mama Teresita) cooked with her heart. You have to do it that way." Cunza appreciates many types of cuisines, and he believes that food can help people share their cultures. He came to the United States to visit family while he was a college student. He gained United States citizenship in 1996, and now Cunza works as a Spanish-language film consultant and editor of Spanish-language newspaper La Noticia. This month (Sept. 15-Oct. 15) marks National Hispanic Heritage Month, so Cunza took special pride in preparing chupe at his home. "It can reflect a lot of what you have inside," he said of cooking. "I haven't had anyone upset with me because they ate with me. I think cooking builds relationships and makes friends and shows your culture as well." Written by Jennifer Justus for The Tennessean newspaper. What is the one degree of separation that divides a city father or a Belle Meade socialite from an immigrant laborer at an Antioch pupuseria? More than likely, it's Yuri Cunza, president of the Nashville Hispanic Chamber of Commerce. In little more than a decade, Cunza has become as ubiquitous as chardonnay at the occasions where Nashville's business elite keep score—without becoming a human cheese tray. Whether working the VIP tent at the Nashville Film Festival, or jazz night at a Murfreesboro Road soul-food kitchen, Cunza constantly presses the flesh and his agenda. He has to. The Hispanic Chamber, founded in 2000 by a group of Nolensville Road business owners, is run primarily these days from Yuri's iPhone, powered by equal parts personality and his ability to make Nashville power brokers believe in him. "We want to reach out to the whole community," Cunza says. "Fostering integration is good for business." Proof lies in the rainbow coalition that gives the chamber its muscle. You're just as likely to see Mayor Karl Dean at a Hispanic Chamber event as you are the Rev. Tex Thomas, the influential pastor of Jefferson Street Baptist Church, or Cerrito, the bilingual country artist. Now the organization boasts around 250 members, and when the time comes to mobilize—as in last month's bludgeoning of the English Only proposal—its punch leaves marks. How did an out-of-towner forge such connections? Friends credit his dedication and seemingly effortless social skill. They describe Cunza's ability to walk into a room full of players, barely knowing a soul, and yet an hour later introduce two near-total strangers to each other on some common basis. They say he advances his causes through old-fashioned diplomatic arts: subtlety, genuine interest in others, and good listening. Cunza came to Nashville from Peru in 1996 to study medicine at Vanderbilt, where his uncle is a professor. But he soon became enamored with helping Nashville's immigrant community. "It was a time where there was a need for a muscular, unified voice for Hispanics in Nashville," says Cunza. "The community was really flourishing for the first time and I wanted to play a role in that." Recently, Cunza has made a point of improving relations with the national Hispanic Chamber, giving his organization a broader reach. "There is a very well thought-out legislative agenda that will affect all Latinos throughout the U.S.," says Cunza, who received his U.S. citizenship in 2006. "We have a voice in that discussion about economic development, housing and of course, immigration." In addition to his chamber duties, Cunza is a writer and publisher of La Noticia, one of Nashville's most widely circulated Spanish-language newspapers. He also acts, occasionally appearing in commercials and independent films. But the chamber remains his primary focus. "We are not a social club," says Cunza, seasoned warrior of the schmooze circuit. "We're planting a seed for the future, and that's very serious business."